Sensibility’s career best performance came as a 3YO in the G1 Flight Stakes at Randwick (pictured) where, at just her third start, she finished 2nd behind four-time G1 winner Guelph, with classy pair Bound For Earth and Arabian Gold in arrears. A daughter of Champion Sire Redoute’s Choice (broodmare sire of the likes of Zoustar, Kementari, Sacred Falls and Arcadia Queen among 13 individual G1 winners), Sensibility is a three-quarter sister to top class 2YO Running Tall and hails from the family of international stars Frosted and Midshipman. Sensibility’s first two foals (a Sebring colt and an I Am Invincible filly) have sold for $730,000 and $450,000 respectively. Peter O’Brien of Segenhoe Stud, who will offer Sensibility at The Chairman’s Sale, had mixed emotions about selling the mare. “She’s a stunning looking mare who produces great looking stock,’’ O’Brien said. “Her second foal Sensitivity, by I Am Invincible, is very well regarded by Ciaron Maher who ran her in the G3 Blue Diamond Prelude (Fillies) a couple of weeks ago at just her second start. “Her I Am Invincible weanling colt would be in the top five foals on the farm and she’s back in foal to I Am Invincible. Maher confirmed his big opinion of Sensitivity. 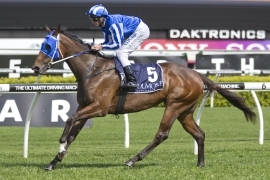 “Sensitivity has shown us great ability and I’ve no doubt she will progress into a Stakes-winning 3YO,’’ Maher said. Wildcard entries to The Chairman’s Sale are being accepted until 10am on Monday April 22. The Chairman’s Sale will be held at Riverside Side on the evening of Friday May 3, from 6.30pm.